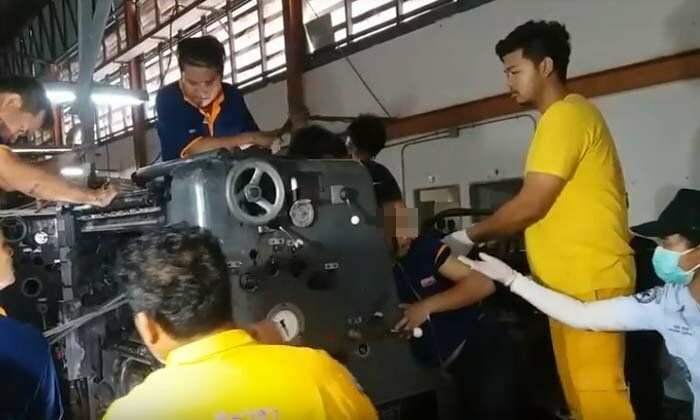 Rescue services in Sri Racha were called to a large printing works in the Nong Kham area after a 20 year old Thai worker got his right arm pulled into a printing press. Amarin was cleaning ink from the machine at the time when the rollers dragged his arm in. Fellow workers rushed to stop the machine before loosening some components to easy the young man's agony. But it needed staff of a rescue foundation to spend half an hour with cutting equipment before he was released and rushed to hospital in Sri Racha. Too many lost limbs around due to lack of a sense of safety. Was the machine switched off or was that too much trouble? The machine suffered “Brake Fade”. Surely the machine must be switched off before performing a servicing procedure like that. It’s like putting a screw driver into a live power socket to tighten a screw!! He is certainly from the bottom of the gene pool. Let’s hope he doesn’t procreate!! Switching off isnt good enough..lock out/tag out is the norm, but your point is well taken. Scary but very similar to the safety breaches I have seen in the other developing countrys Ive worked in. Workers walking across beams with their harness attatched to their non existant "sky hook", working on live equipment etc and all seemingly oblivious to the risks. The Heidelberg press in the picture needs to be running to clean the rollers, its the normal way to do it worldwide. he definitely did something he shouldn't though, such as got a rag too close to the spinning rollers.